Having been the longest stop on my trip thus far (10 nights there – unheard of on most travelers’ circuits – I spoke to some who spent only one day there – unfathomable to me! ), I thought it important to return there. Not literally, of course, but to chronicle my time before the temples begin to fade into a distant memory – the ruins and temples are like none other I’ve seen anywhere … and I’ve seen some ruins and temples in my time – from Ephesus in Turkey … to Chichen Itza, Tulum and ones further a field in Mexico … from Petra in Jordan … to Tikal in Guatemala … from the former glories in Greece and Italy … to, well, right now, to Angkor Wat in Cambodia. I wasn’t sure when I arrived how long I would take to visit the temples – they are spread out over more than 50 miles, unlike any other ruins area I’ve visited before. And the tickets are expensive. One day is $20, three days are $45 and a seven-day ticket is $60. It was also strongly encouraged to hire a guide for at least some of the days, which cost an additional $25 or so per day. And then there was the tuk tuk driver that needed to be hired, too. 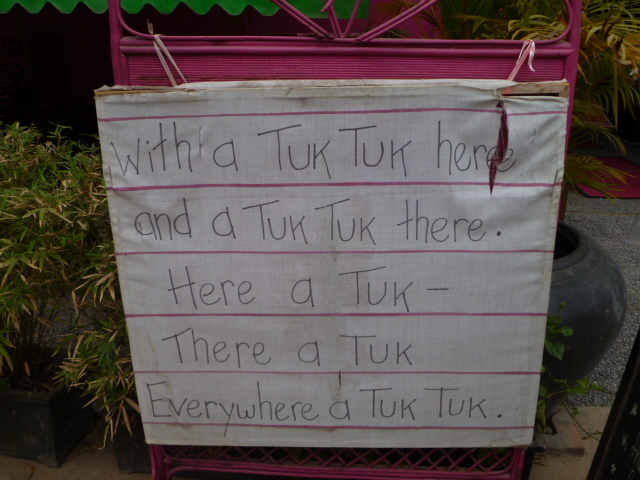 Guides and tuk tuk drivers are never the same person. And while I could hire a moto-driver or even ride a bicycle, in the intensity of this heat, both of those options would not be nearly as comfortable as a shaded and easy-going tuk tuk. The costs kept adding up! I knew my budget would be getting a work-over here; but I also knew that I would most likely never return, so I wasn’t going to scrimp on time or money. I toyed between the 3-day and 7-day ticket for a bit, wondering if I would be ‘templed-out’ after 3 days. But I ended up going for the 7-day ticket and looking back, it was the best decision for my time there. I arrived in Siem Reap around 11 pm after a very long day of travel from southern Lao. The final leg of that trip had been in a mini-van that should have held about 8 people – we were 14. It was crunched, hot and loud – one of the guides talked and giggled incessantly through our 4-hour trip, offering his guide experience through Siem Reap. The other tourists were 20-somethings who were lapping up his antics. No, thank you, I won’t be needing your guide services – he gave up on me rather quickly when the other travelers were clearly more interested. I had booked an advance reservation with a small hotel – the owner had emailed me and told me he would have a tuk tuk driver at the bus station waiting for me and another traveler also staying at his place. We arrived to several waiting tuk tuks, but not one from the Two Dragons Guest House – rather than wait for one from there that might or might not show – we both decided to grab the last one that was available. It was late and the bus station was dark and lonely – no need to create stress at this late hour. We found our way to the guest house and I was relieved to find a clean, comfortable and cozy room. I went directly to bed and fell asleep in no time. There was no way I was going to start an early temple day right away. After my long day of travel, I knew that the best thing to do would be to ease into this busy tourist place. So I did just that – I hung out at the hotel a bit, chatted with the ex-pat owner and his ex-pat friend who dropped by; and then I spent most of the day walking the town and acquainting myself with being in a new country and a busy tourist center. While I chose not to stay in the Old Market neighborhood which is a total tourist ghetto, the kilometer long walk there along the chocolate-milk colored, litter-strewn river was a pleasant stroll, even as I was asked every few meters whether I wanted a tuk tuk ride or a massage. There were also beggars everywhere, like I had never seen before. Many are land mine victims, many are blind. Some are selling things (books, musical instruments, cheap bracelets and trinkets) and all of them appear desperately poor. They are everywhere in the city and it’s painful to see them; to realize what caused their plight and to once again, not look away, but to recognize their humanity amidst the severity of their physical disfigurement. Siem Reap has grown like crazy over the last decade – what had been a sleepy village was now a full-fledged city, bustling with traffic and tourists that was a far cry from any place I had yet encountered. For the first time, there were actually markets selling all kinds of trinkets and souvenirs. 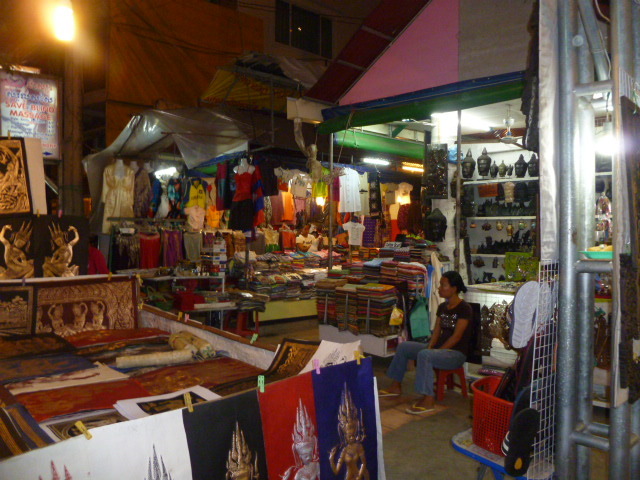 The Old Market, the Central Market, the Night Market – all kinds of markets from which to choose … although the stuff on offer in the jam-packed stalls was all the same, most of which came from Thailand. The standard items were being hawked and every stall worker was relentless in their pursuit of the dollar – “Hello, Madame, want to buy something? Please, please stop here at my shop and buy something!” This refrain echoed endlessly as I wound my way through the market maze. T-shirts, bags, fabric, scarves, table cloths, place mats, statuary – all the typical stuff. Nothing much got my attention as I clearly didn’t want to lug any of it around. I had also heard that the markets in Phnom Penh were better value, so I though I would wait until then if I simply ‘had’ to have something. With that said, I did break down and buy a pair of pants and a t-shirt – I simply needed to spruce up my wardrobe at least a little bit. Buying a t-shirt was no small feat – these are little people here; and although the people buying here are mostly all tourists, the t-shirt sizes are made for the Khmer bodies, certainly not the Westerners and definitely not this Westerner! After looking through dozens of stalls and seeing that size XL really meant XS, I finally found one shirt that I imagined would fit, at least before the first washing that would likely shrink it to doll size. It was all of $2 after my masterful haggling skills, so I thought it was worth the gamble. It’s actually held up rather nicely, although it’s no longer close to the white color it was when I bought it. 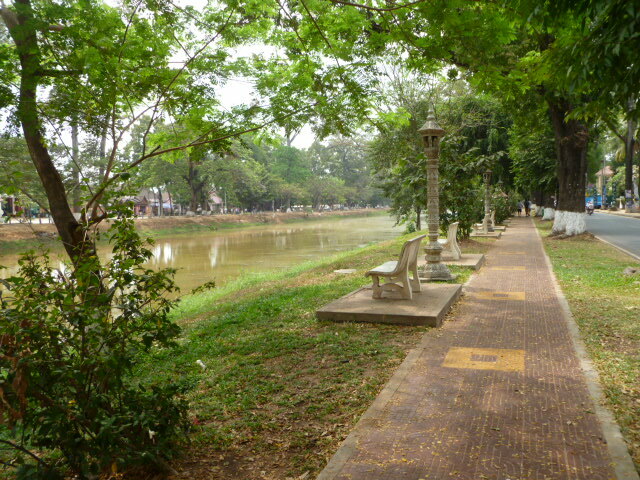 The next day I explored some more with leisurely strolls along the riverside and through town. I had yet another massage. I drank cool drinks and talked to my sister on skype while feasting on a great meal on ‘Pub Street.’ Feeling rested and ready, I decided it was time to make my way to the temples. While I spoke to Gordon at the guest house, who was known at one time to have been an engaging and encyclopedic resource of how to spend time here; his enthusiasm had waned with his decision to return to the States. Now his conversation was punctuated primarily with cynical and desultory commentary on the wanton state of the Cambodian life, culture and government. While I ‘felt his pain,’ he was not nearly as helpful as I had hoped he would be. So when I asked him, for example what I absolutely should not miss – “guide me please to a temple itinerary that will enchant me” – he replied with an empty gaze and lackluster information. It seemed it would be up to me and what I had already read and researched to make the temple exploration an exciting one. While disappointed, I made the adjustment quickly. 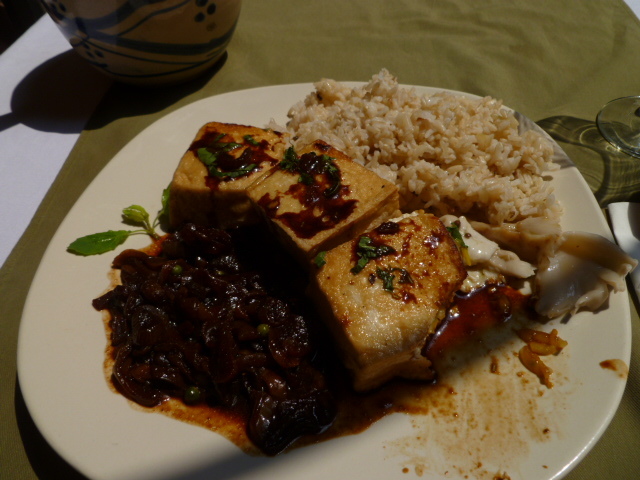 Really yummy stuffed tofu with chutney! Then, as I was walking back to the Two Dragons Guest House in the late afternoon, I saw a storefront tour company, Peace of Angkor Tours. I rarely venture into such places, but the name was catchy and I thought I’d take the chance and see if I could get a few tips. There I met another ex-pat from England way who was brimming with information and enthusiasm, just the kind I had been looking for in Gordon. He explained the different tours their company had on offer, the prices and some ideas on how to cope with the strain of tourist hoards. He even told me not to take one of their tours – that that day could easily be done on my own simply with a tuk tuk driver. He did recommend a tour out to the temples at a far distance in an air-conditioned, smooth sailing van – the heat would be exhaustive in a tuk tuk and the bumpy ride would wear thin after a few kilometers. He spent a good hour with me and I was convinced. I signed up for two full days of tours with them, beginning the next day. 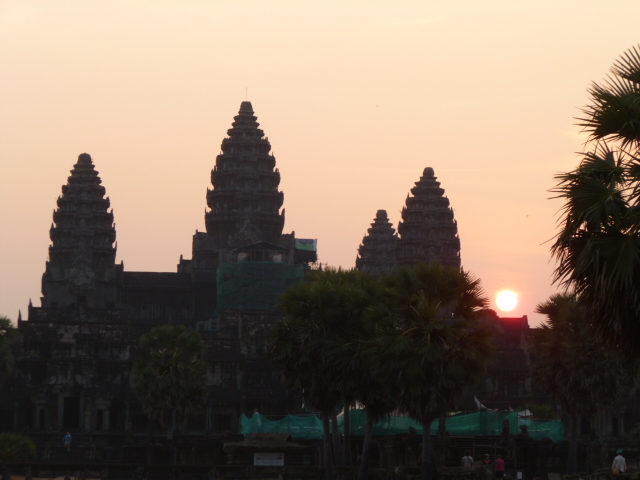 First, “The Grand Circuit” through the Angkor Wat area, covering many temples strewn over a wide distance in the major temple complex, complete with sunrise at Angkor Wat. 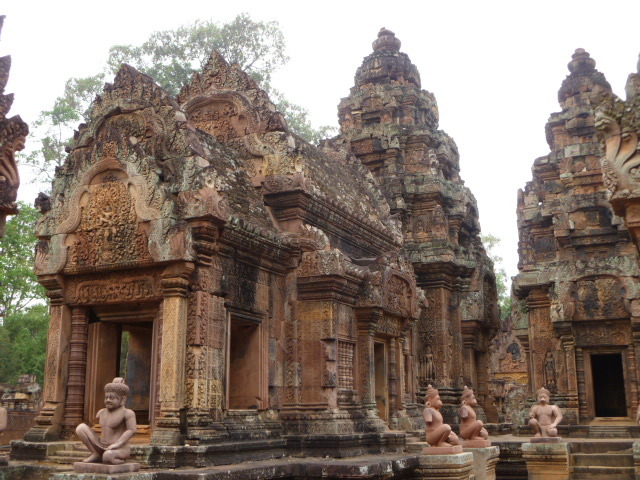 The second day would be a long drive out to the countryside to primarily three temples: a several-hour hike through a forested area to Kpal Spean, “The River of 1000 Lingas”; Banteay Srai, the Temple of Women; and the overgrown and considered most atmospheric of them all, Beng Melea. He couldn’t have any idea how enchanted I felt already! While it was spendy … wayyyyy spendy, I reminded myself that this would be my one and only time at Angkor Wat – I parted with the dollars and was on my way, reminded to be ready at 5:30 for tomorrow’s sunrise tour. Also before I left, he gave me a tip on where I could go this evening for the sunset. I headed back home for a rest before I ventured out for my first afternoon at the temples. 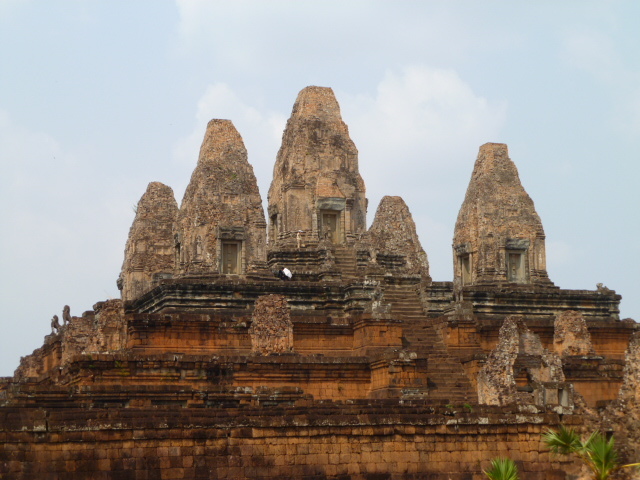 I headed to Pre Rup, the 10th century temple that had been dedicated to Shiva. 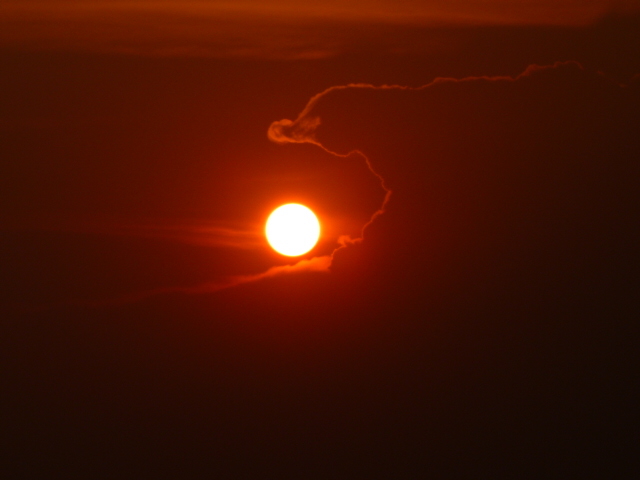 While it was late afternoon, the blistering heat and humidity were still present. I looked up at the five towers, the seemingly hundreds of steps leading to them; and with water bottle in hand, I headed to make my climb. The temple was built on three levels; with entrances at the cardinal directions (this was to become a theme throughout) and carved stone lions standing in protection at each of them. 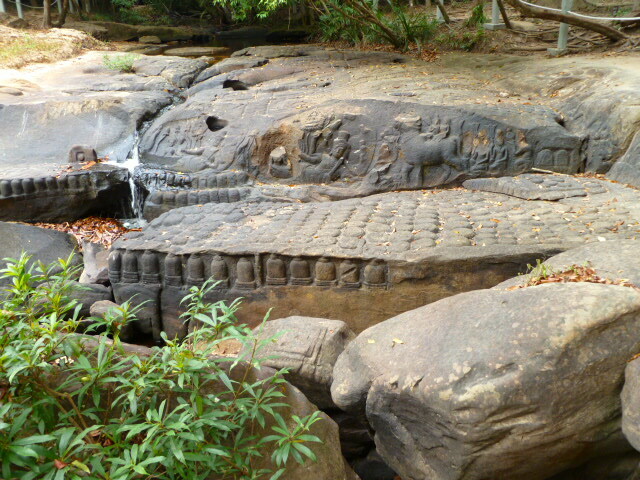 Stone lingas were everywhere as were the figures of dancing women – Apsara Dancers as they are known. These were my first of hundreds I would see through my temple travels. Between the lingas and the Apsaras, I was hard-pressed to focus on the sunset! The climb up was a bit harrowing, but already I realized that the trick to this temple climbing was going to be – slowly, slowly. The stairs are wide apart (these people were/are very small – not sure why the steps are so wide!) and very, very narrow. I clung to the stone sides and made my way up. There were plenty of other tourists around, also awaiting the sunset, but I found a little nitch to call my own and settled in. 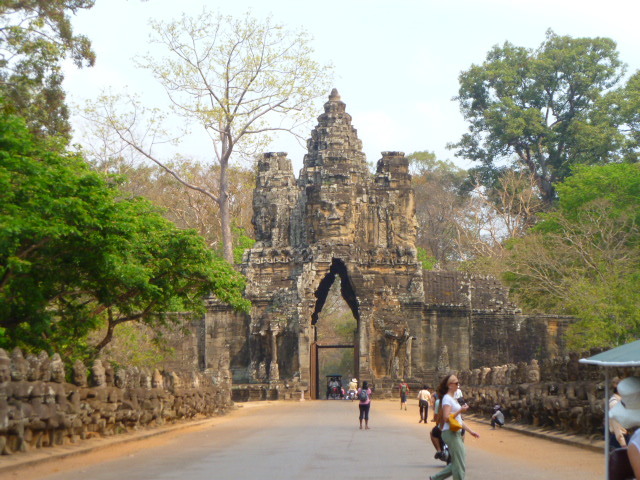 I made a decision long before arriving at Siem Reap that I would just roll with the onslaught of the tourist crowds. There was no way to avoid them, I understood, so I would frame them as fellow pilgrims, focus on the temples and let the crowds fade into the background. Mostly I succeeded. A Canadian mother-daughter team was seated nearby and I recognized them from my guest house. The daughter was working for an NGO in Phnom Penh and mom was here visiting. I loved seeing them not only traveling together, but delighting in one another. Mom had a fear of heights and was wondering what the hell she was doing up there, but with her adventurous spirit, she was determined. I was even more impressed as they ambled their way down, daughter guiding mom patiently and lovingly. I was touched by the twosome that was them. I found my way home shortly before dark to have a quiet evening in preparation for my early morning. It indeed came early and the van was on time for my pick up. There was a driver and a guide and I was excited! Two more people were to join us and we headed out to pick them up – when we stopped at Le Meridien, I thought perhaps my long-awaited Sugar Daddy would finally show. No such luck. They were a French couple, my age-ish and perhaps sleepy in this early morning hour, but as they boarded the van, the woman barely greeted me and the man didn’t even make eye contact. It didn’t improve much from there. Not only did they not speak a word to me the entire time, but they barely spoke to one another. As we walked through the temples, they snapped photos with high-powered, very fancy cameras, but walked separately throughout all of our visits. What felt to me like tension between them was awkward for me as I oohhed and aahhed my way through temple after temple of lingas, Apsara dancers and antiquity and mystery that held me in rapt, awed attention. But still, it was difficult not to be affected by their complete lack of communication and their almost ho-hum response to the temples. Imagine, I thought, staying at the luxurious, opulent Le Meridien, visiting one of the world’s greatest wonders, Angkor Wat, and moving through it all, it seemed, uninspired and unenthused. How sad for them. Or at the very least for me, being with them! I wondered what they had to teach me – how I could keep my heart open and resist the temptation to judge them, already quick as I was to jump to my opinions and conclusions. I didn’t know their story, I reminded myself, and surely they didn’t need or deserve my judgment. It was an exercise in patience, a yoga of the heart, which this journey appears to be offering me at many turns. I thought this was another important one. 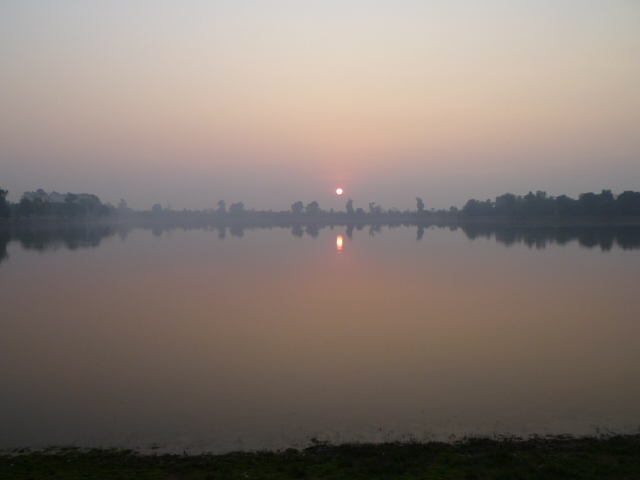 Sunrise at Angkor Wat – This is the sunrise place in the ‘park.’ Everyone wants to see the sun rise over the temple and the temple reflected in the water at the nearby pond. The guide led us in the still-darkness along with the steady stream procession of visitors. In the darkness before the light, it indeed had the feeling of a pilgrimage and I wondered what it was like centuries ago when the masses descended upon the place in holy reverence. I tried to imagine that that’s what we were all doing, too, in our own ways. Photographers with tripods were set up everywhere, waiting for the moment of light. Although very crowded, people were subdued, purposely so, it seemed, and I was grateful for that. Perhaps it was just the early morning hour, but I liked my interpretation better, so I stuck with that. 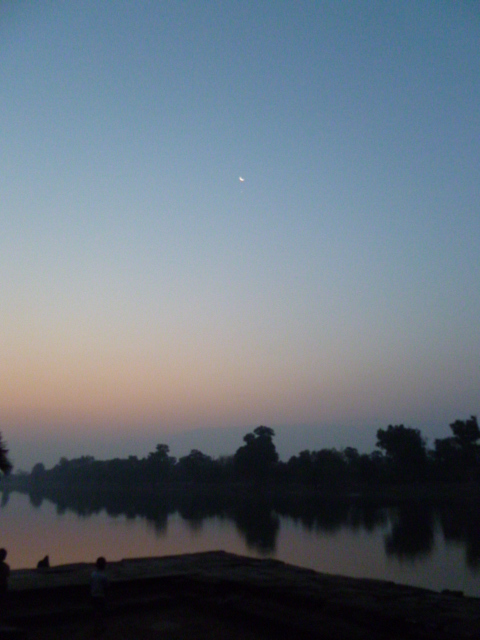 I found a place near the water’s edge and watched daybreak light up the temples and the sky. It seemed the rest of the morning was a blur of temples. The guide was very well informed about the history and the details that he wanted to share, but I had the feeling that he had a script from which he was reading. When I asked questions that veered from his script, he either ignored them or didn’t know the answers. I was beginning to wonder about this tour idea. But still, I was so entranced with the temples that I just kept coming back to them and they helped to keep me focused on why I was there. It was a walking meditation – come back to the breath; come back to the purpose; notice the distractions, but keep letting go and coming back. As the day continued and the sun got higher in the sky, the heat’s intensity and the fast pace at which we were moving was wearing me out. Although there were only four of us, I felt like I was being pushed to keep up with them at a pace that was faster than I wanted to go. So push on I did; but by the end of the day, I was very weary and leery of spending another day like this tomorrow. I had already paid for the next day’s tour; and unfortunately, it was with this guide and these folks. While I could have all the compassion in the world for them, that didn’t mean I needed to spend anymore time with them! The next day was an even longer one and a long drive to the countryside. I really didn’t want to spend hours in the van surrounded with their silence. I decided I would go back to the tour company and have a little chat about it. Warren was there and while I loved the temples, I said, I explained to him that I really didn’t want to spend another full day with that couple and wondered if they had another similar tour in the next week or so. They didn’t, but he told me that a fourth person (a woman) would also be joining us. 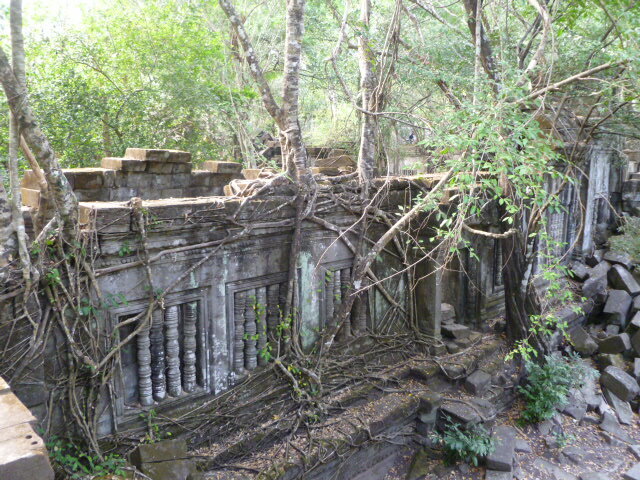 Hhmmm – this day really did require a tour just to arrange all the details of seeing these more remote temples. It seemed they could really be the highlight of my whole temple experience. But ohhhh, these people – what to do? While a very big part of me wanted to cancel, I also didn’t want to spite myself out of the experience – okay, I’ll be hopeful that I can have the buffer of another person and not feel so affected by this couple. I agreed, I was in. The evening was short as it was another early morning start. I had dinner, an hour-long foot massage (a very, very good idea) and I was soon to bed. I was picked up first, then we headed to pick up the new woman – and there was a world of difference before she even got into the van. She was waiting curbside with … ohmibuddha … an eager smile on her face! And herein began a whole new chapter of temple exploration for me. While the French couple was still aloof, the woman was much more talkative throughout the day, particularly with Petra. The man remained distant and their connection together still appeared to be almost non-existent. But enough about them. It was time for a change and Petra brought that with her – how grateful I was that she showed up! The day indeed proved to be an outstanding one. The guide continued to try to rush us; and while the French couple kept up with him, now it was Petra and I lingering, stopping for views and photos and moving at our own gentle pace. Why was it easier, I wondered, to stake my claim to my own pace, to let go of even trying to keep up now that another person was there? There was power in numbers, even in only two and we used it to our benefit! One of Petra’s greatest joys is photography and she was as mesmerized with the temples as I – it was the ‘right’ decision to give this day a go. 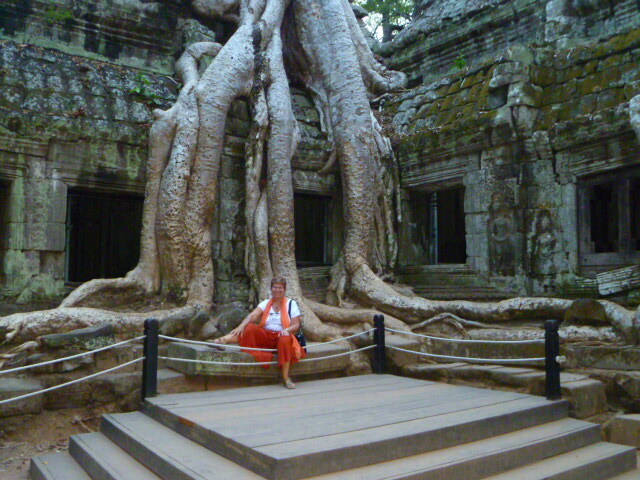 Petra is a German woman living in Tokyo for the past 17 years with her husband – she’s an administrator at a German school and she had been at a work conference in Bangkok and added Siem Reap onto her itinerary. She spoke the best English I had ever heard from a German person and we spoke about everything from life in Germany, Hawaii, Tokyo and here in Cambodia. We discussed our interests of writing and photography and the flow was easy and relaxed. She was upbeat, positive and energetic. And I had a new friend! Our hike to the River of 1000 Lingas was a beautiful forested path that offered lots of shade and moments for reflection and quiet. 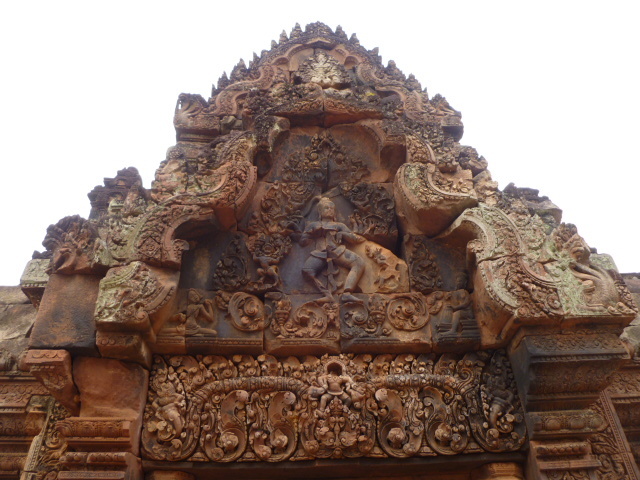 Banteay Srei, a 10th century Hindu temple is one like no other – built more on a human scale than the god and goddess scale of most all other temples, its carvings are considered some of the finest in the world and the restoration work is outstanding – it was a place of exquisite gentleness. 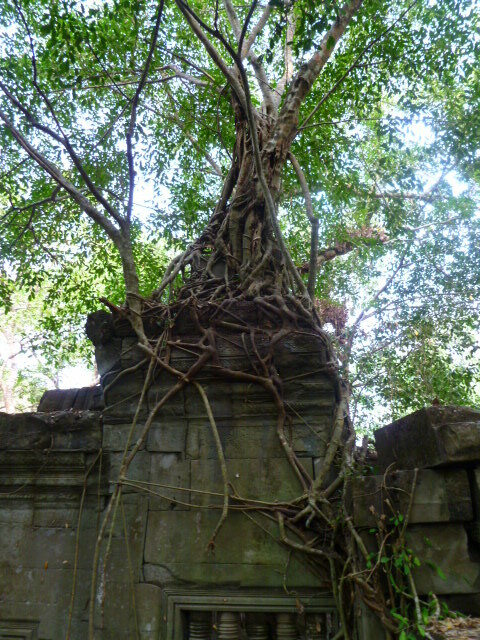 We then enjoyed a fabulous lunch at an open air restaurant and headed for Beng Melea which was the piece de resistance of the day – a glorious place that had collapsed in on itself and been taken over by the jungle. Rather than refurbish this temple like was underway at so many, they decided instead to leave it in its decaying state and to build raised wooden walkways through it all – it was the perfect decision! 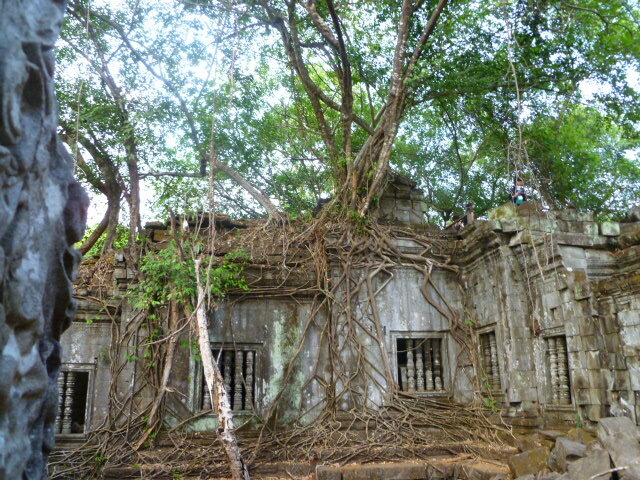 It felt like a surreal Lost World kind of place – complete with piles of rubble, underground galleries, massive trees growing through the temples and everywhere, rays of light flashing through former windows and doorways. The celestial Apsara dancers were in full attendance and as we scrambled and climbed through the walls and tunnels, I was a kid again. Only Ta Prohm came close to the mystery and atmosphere of this place – an otherworldly, mysterious and ancient site – my very favorite of all! As our day was winding down, the heat and fullness of the day was beginning to take its toll. I still had plenty of touring ahead of me, but for the rest of the time, I was on my own – my days of being on a guided tour in an organized group were over; and now that I had more of the lay of the land, I had some idea of how to move forward. Petra and I casually discussed our plans for tomorrow – I planned to hire a tuk tuk from the guest house and take in another full day of temples – those on “The Petit Circuit” and some of the grandest of all – it was going to be another day of exciting exploration. Before we knew it, we were making plans to do it together. Petra had only a few more days and wanted to get the most out of her time. I explained what I knew about the remaining major temples to be seen and we knew our paces were in sync, so it was effortless to make our plan. She came with me to discuss it with the tuk tuk driver and although I had done it before, we decided to get up for another sunrise at Angkor Wat. Wow – another bright and early day up and out before the dawn. We spent some hours at Angkor Wat after the sunrise, moving through the vast temple grounds and ascending into the highest point with expansive views into the far distance. Apsara dancers followed us everywhere and we had fun sharing our awe-filled impressions. The whole time, our tuk tuk driver waited patiently for us, taking us from one temple to the next as we requested. He was to become our almost-constant companion and the three of us got on famously. 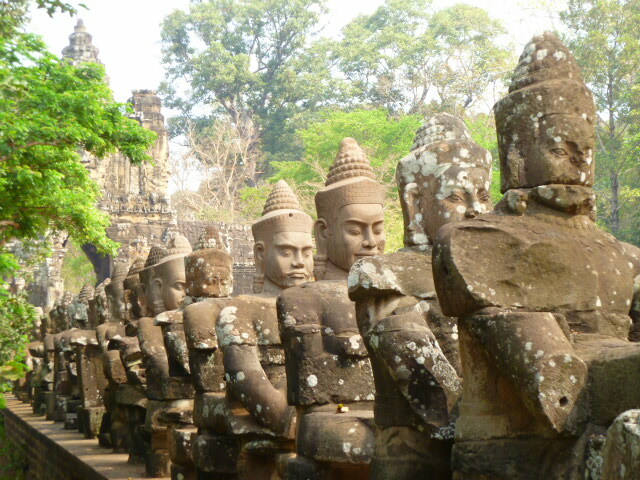 From Angkor Wat, we proceeded to the one of the most impressive of all – Angkor Thom and the Bayon. 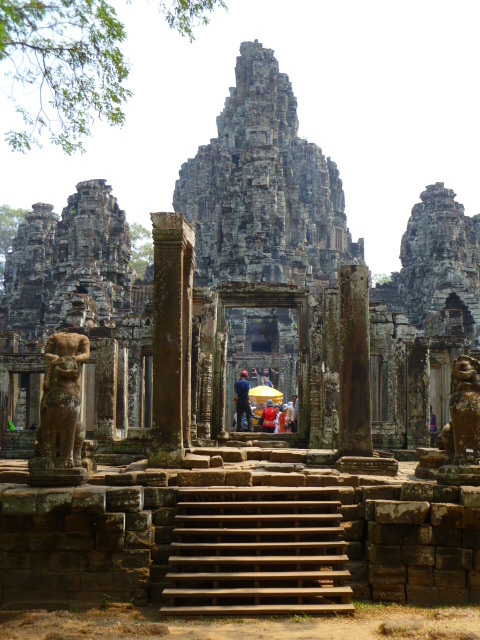 I’ve already written with some detail about the extraordinary Bayon – we wandered through there and although incredible, we went at a time when it was truly mobbed with people. This was more distracting than we would have preferred, but still the energy there was powerful and palpable. 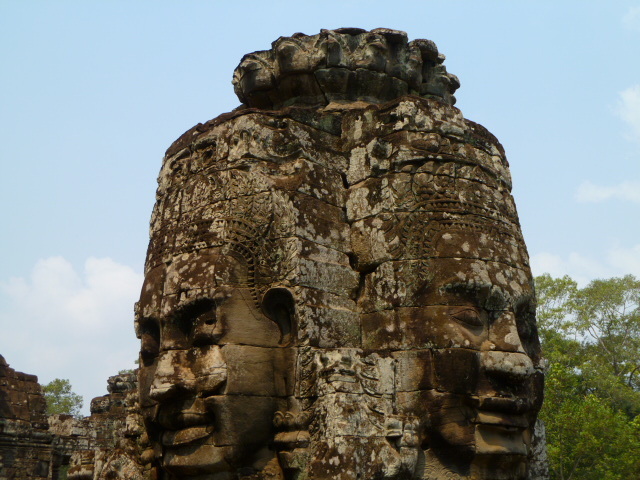 Angkor Thom is a massive place – 10 square kilometers built in the 12th and 13th centuries; and it is thought that one million people lived within its boundaries. That was hard to fathom as we wandered, trying to imagine what it could be like bursting with so many people, although it sometimes felt like it was close to that with the current tourist population. There are five wide causeways that lead through enormous gates into the compound, but the most dramatic part are the balustrades formed by 54 gods on the left and 54 demons on the right of each one. Bigger than life, the facial expressions are haunting. The entire place is said to be a representation of the Hindu universe – it was on a scale that certainly felt bigger than just this world. We were both beginning to wilt from the heat, so we decided to give the temples and ourselves a rest for a few hours and headed to Petra’s place, the River Garden, where I enjoyed a glorious swim in the hotel pool and we lunched on yummy soup and salad. Again, our pace and the ease of our interactions were a delight. Refreshed and rejuvenated, we decided to return for the final temple visit of the day to Ta Prohm – Ta Prohm felt like Beng Melea’s cousin – eerie and atmospheric and filled with those temple-eating trees that took my breath away. We wandered around until closing time, but we both wanted more time there. As we headed home, not sure what our evening plans were, we discussed the idea of going to see an Apsara dance performance – the staff at the Two Dragons Guest House told me about one that was a good deal, so we went back to get more details and Dohn took us there. It was a huge jolt – a gargantuan ballroom type place of a hotel that held at least 500 people and was teeming with tourists, mostly Japanese and Chinese – and a massive buffet that snaked around in every direction. We found our way to our table and had the good fortune to sit with two young people from San Francisco – the woman was Cambodian-American and shared some wonderful insights into the local life and culture. I gorged myself as only buffets will make me do and after we shared a bottle of beer and realized we could hardly see the dancers from our seats, our fatigue took over and we both agreed to call it a night. 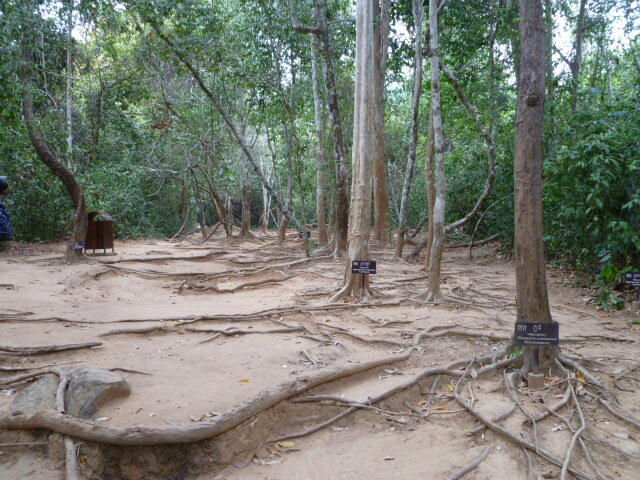 Especially since we had decided to spend sunrise at Ta Prohm, an unlikely and not often chosen place for that time of day since it was so densely forested – all the more reason to head straight there before the crowds. I had originally thought I would take tomorrow as a day of rest; but we were on a roll and Petra was leaving soon. Having her company was worth pushing myself for another early morning! I had to get up even earlier since I had decided to move to a different guest house down the road from the Two Dragons – the New Apsara Market and Guest House, run by a friendly and helpful Khmer family (of which Dohn was not only a member, but he and his family also lived at the Guest House!). It was half the price of the Two Dragons, I had a balcony, a frig and a safe in my room – it was a great change! I brought my things very early in the morning and we were off to pick up Petra! Day 4 of More Temples! What a fine decision this was – up before dawn again as we tuk-tuk’ed our way in the dark to Ta Prohm – we were the first ones there (and the last ones to leave last night!) – and spent hours, taking photos, sitting in meditation and walking the forest perimeter. Sometimes we ambled off in our own directions and then met back – and always, we returned with excitement and delight in sharing our experience. Petra had signed up for a cooking class during the afternoon and I thought I might take a rest. Really, I am simultaneously exhausted and exhilarated with these temples! But there was no rest to be had. 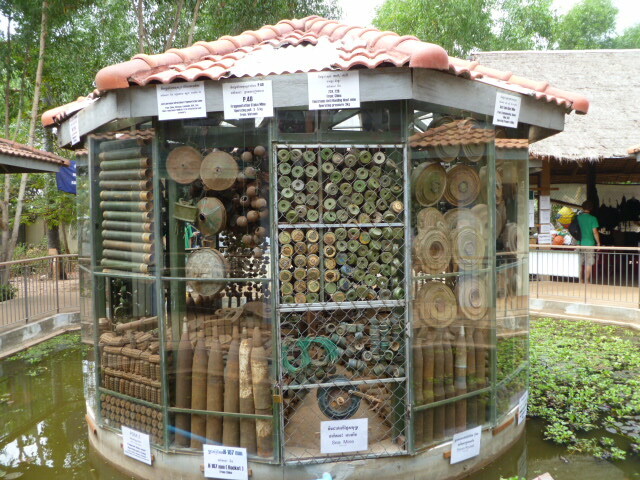 Dohn and I headed out to theAngkor Butterfly Center and the Land Mine Museum, two places that were on my long list of places I wanted to see. They were close by one another and what a juxtaposition of an afternoon – first I wandered through a screened-in botanical garden where hundreds of butterflies flew all around me. I also learned about the life cycle of caterpillars and butterflies and saw them in all their stages. This was a project of an Irish guy that was looking to find a way to give the local farmers sustainable work – he had found and created it in this place. 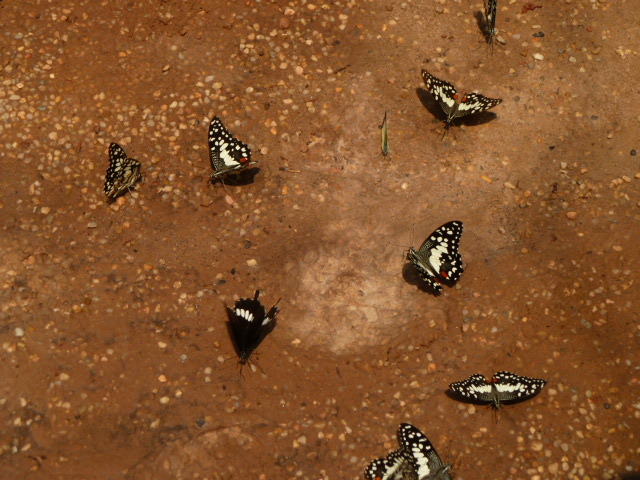 Now the local farmers were raising a large variety of butterflies and had found a way to support their lives and their families. The young man who toured me around the place spoke excellent English and told me how at one time he used to kill caterpillars just for the fun of it. Now, he proudly said, he educated people about them and protected them. It was a very sweet and relaxed time there. Can’t say the same for the Land Mine Museum, though – how sobering it was to see the displays of bombs and mines and their devastating effects not only on the land, of course; but especially on the people whose lives continue to be at risk with all that has yet to be removed. There was an American guy giving a tour there – there was something bothersome for me about the way he matter-of-factly rattled off statistics after statistics of limbs and lives lost, with flat affect and tone to match. I couldn’t quite take it all in with the same attitude. I walked out of there reminded of the long lasting results of war that are far away from our American eyes and memories and yet are what these people must continue to live with every day. A small sampling of what still lies just below the surface all over this country. 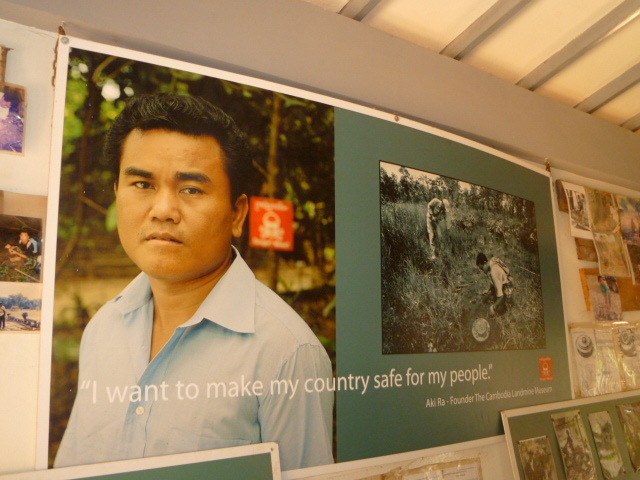 The man responsible for helping to clear Cambodia of mines. 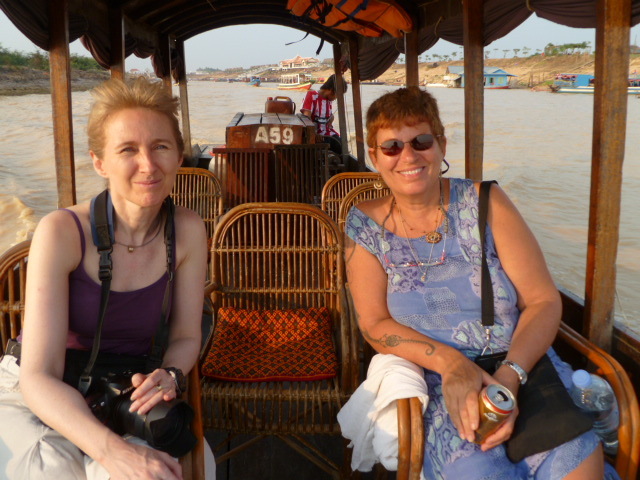 Petra and I met back up after I returned to town and we took at boat ride on the Tonle Sap Lake, a huge body of water and a critical one to the Cambodians. I had been warned against doing the very one we decided to do – told that it was a total tourist scam and rip-off. Unfortunately, all I had been warned of turned out to be true, but we enjoyed our last evening together anyway and I took it as a reminder to listen to those caveats in the future! The sunset was beautiful over the water and we tried to ignore the rest of the scene which was not nearly so attractive. Petra had been able to change her ticket and extend her time in Siem Reap and we decided we would enjoy yet one more sunrise together on her last day in town. Ohmigod, another early morning before the dawn? Yes, another early morning before the dawn! I jokingly told Petra I needed her to leave town so I could get some rest! 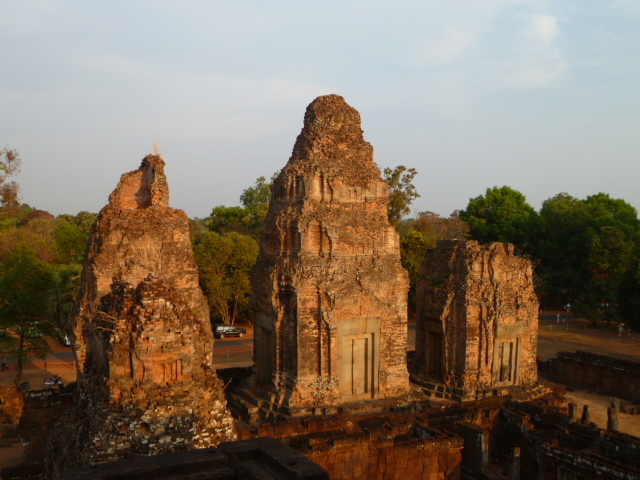 One of the temples, Phnom Bakheng, is a place where most visitors go to watch the sunset. We noticed the throngs of people there one day and decided we didn’t want to be amongst them all, so we decided to go to the place for sunrise, instead – what a fine idea! It was a little bit of a hike up, but it was cool and once we got to the top, while we weren’t completely alone, there were only a few people who had also made the journey up. 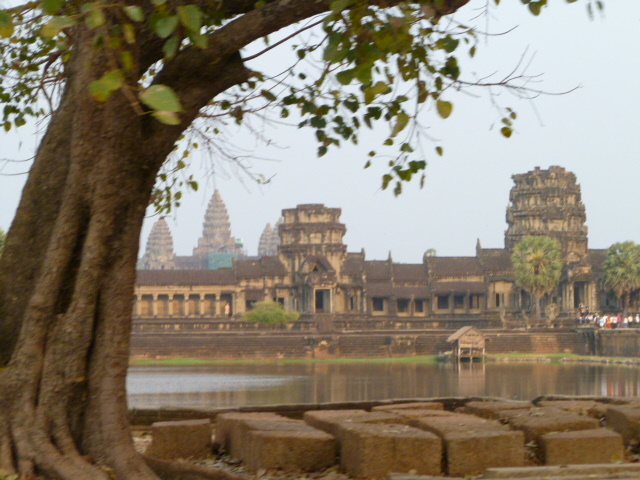 We could see Angkor Wat in the distance and panoramic views in every direction. So quiet, so peaceful, so beautiful, this place! It was our last temple visit together as Petra would leave later that day. We did a little shopping together and said our goodbyes, filled with gratitude and delight that we had found one another and enjoyed our time together so effortlessly. I went back to my room for a rest before the concert at the Bayon that I’ve already written about at length – I was sorry for Petra to miss it, but so glad I got to experience this phenomenon! I’ve thought of Petra often since our time together at Angkor Wat, not only because of how wonderful it was, but also to a great extent because of the catastrophic events in Japan – I hope she’s doing well in the midst of it all as so many people there figure out how to cope with this tragedy – sending you lots of love, Petra! Day 6, Yes Day 6 of Temples! I actually really did take a day off after Petra left (geez, it sounds like I’m talking about a job or something!) – I did absolutely nothing for one whole day – wow, what a treat that was – it felt great to just rest and relax and read and nap and take it easy! The following day I had another slow one, even spent the afternoon at the pool of a nearby hotel – ahhhh, that was a wonderful way to wile away a few hours – lying in the sun and jumping in the water every 5 minutes to cool off. The heat managed to stay intense throughout all my days in Siem Reap, so this day was a welcome relief. 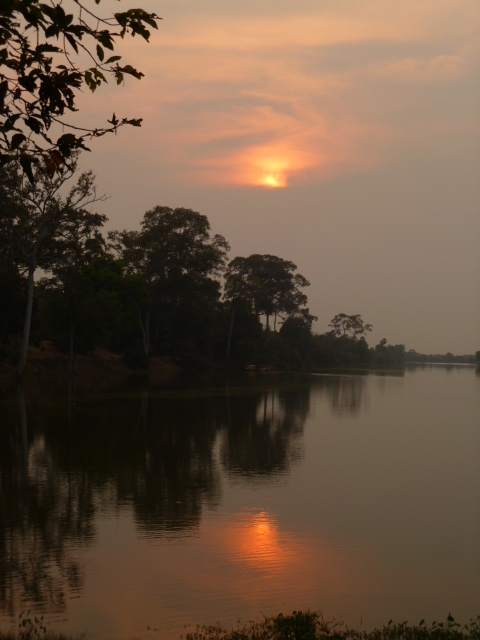 I decided to spend just a few hours this day at the temples in the late afternoon – I went to the South Gate of Angkor Thom – another place I had heard about that was a good spot for a place to avoid the sunset crowds – and so it was! 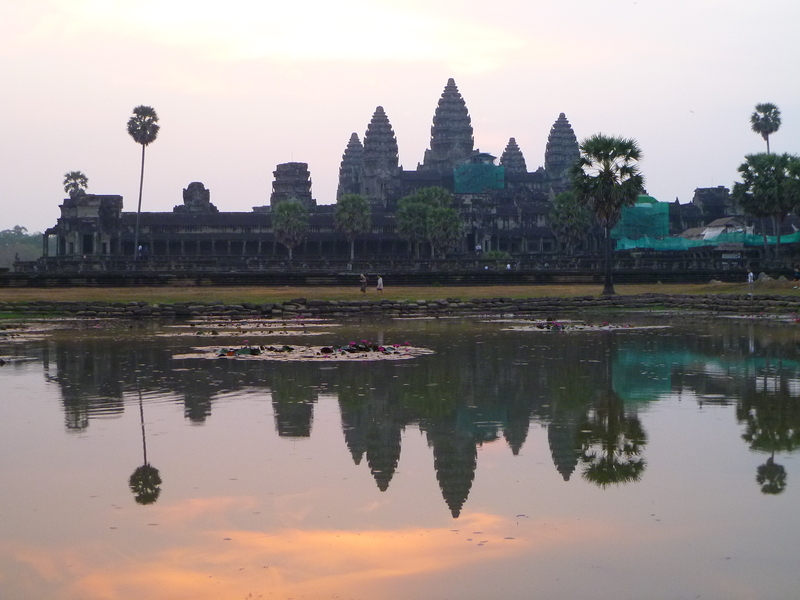 Day 7 – My Final Days at the Temples of Angkor Wat! Now that I had seen most of the temples I had wanted to visit, I decided it was nearing time to take my leave of this part of Cambodia and make my way through the rest of the country. 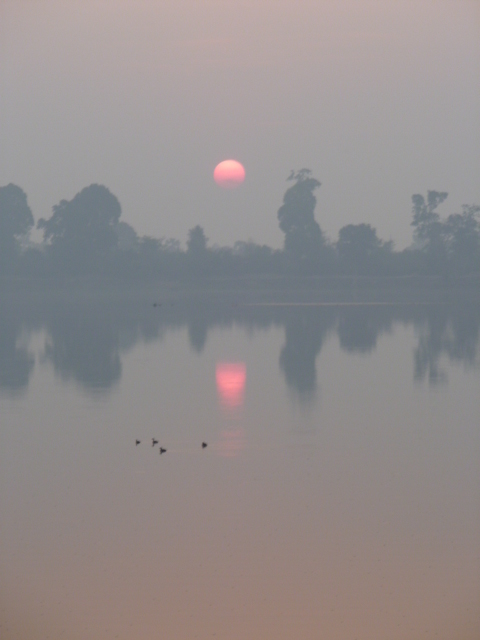 Before I left, though, I would have one more crack-of-dawn morning and head to the park to see the sunrise one last time – this time at another little-visited spot – Sray Sreng – again, there were very few people overlooking the lake and I was pleased to have this quiet morning be my last there. Such a serene and peaceful place to end my temple explorations! Feeling satiated, satisfied and ready to move on, I bid my goodbye to my dear tuk-tuk driver Dohn, his lovely wife and the rest of the family who worked at the guest house, and I boarded the bus to Battambang. My time in Siem Reap and Angkor Wat gave me an easy and comfortable, if not exhausting introduction to the country of Cambodia I came to love so much – with its friendly people and its ancient culture – now I was ready to dive in for more! And so, finally, this ends the chapter on visiting the amazing and ancient temples of Angkor Wat! Well, I don’t know about *all the time*, but what I’ve learned is that authenticity is about the best I’ve got to give – throw in some vulnerability and that’s the recipe for living as fully as I know how. Not easy by any means, but the richest way to be in the world, that’s for sure! I think about PMC frequently and hope the season is coming along fabulously! So sorry I’ll miss the shows, but trust there will be a DVD for posterity somewhere! I hope you’re enjoying your work with the Chorus – I’m sure they are LOVING you!